Once you have your event details live, you can use the page to promote your event and show people what it’s all about. The initial use, however, will be to gather applications from local non-profits – something that this site will handle for you. 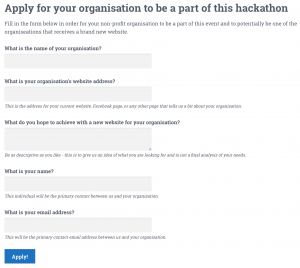 When a non-profit organisation fills in this form, it will add them to the system as a private post, as well as send them an email confirming their application. Once you have gathered enough applications, or your cut-off date has been reached, then you can change the status of your event to ‘Selecting non-profits’. 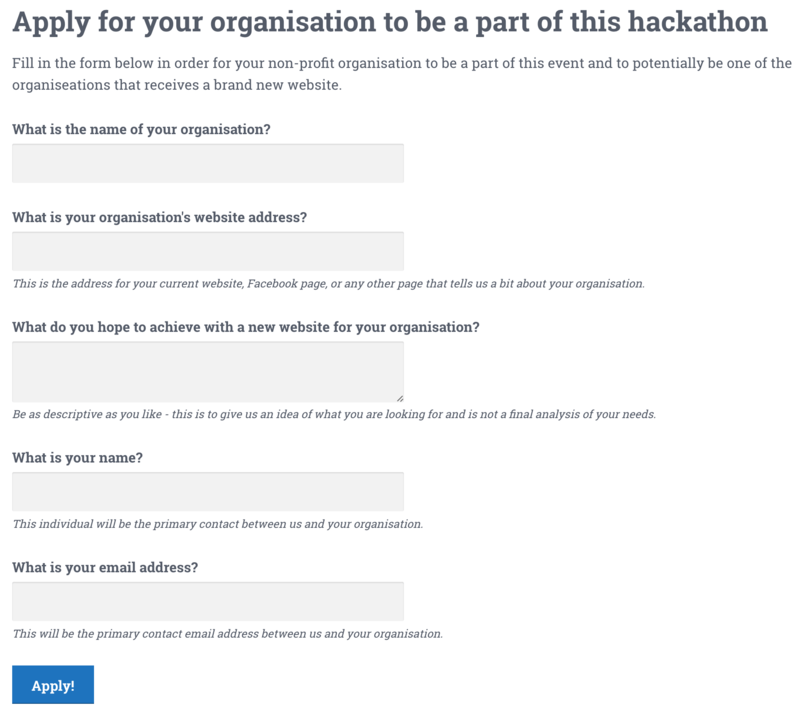 This will display a notice on your event in place of the form stating that you have closed applications and are selecting the non-profits organisation with which you are going to work. How you select your final non-profits is largely up to you (but read the note below for some guidelines), but once you have done so, you need to make sure that all of the non-profit organisations are added to your event in the pre-defined meta field. Once you have added them all then all you need to do is update your event status to ‘Accepting participant sign-ups’ – this will open the event up for people to sign up as participants (which is explained further in the next section). You will notice that all of the available build team roles will be added to each non-profit automatically. If you feel that one of your non-profits does not need all of these roles, or would benefit from some additional role, then you can go ahead and edit that list and individualise it for each organisation. The selected organisations must be registered non-profits – this will work differently depending on your country, but it is an important way of sorting out which ones are serious about their work, and which ones are more temporary. They must be local to your area – this is for practical purposes as it means that they will be able to attend the event itself (which is a requirement). They must be in need of a new website, rather than just wanting something new and shiny even though their current site is perfectly fine. Other than that, you are welcome to make your own calls with the non-profits that you select.